For a Picnic Area Reservation Application click here. For Camping Fees click here. The Marina Café Pass is available for guests who are only visiting the Café for a meal. The pass does not allow for travel throughout the Recreation Area, only from the entrance to the Café and back to exit the Recreation Area. Upon driving into the Recreation Area , inform the gate staff that you will only be eating at the Café. You will be given a special yellow pass with a 1-1/2 hour time limit and parking restricted to the Santa Ana Ramp parking lot. Display the pass on your windshield. Detach the stub and hand in to the staff at the Café. Bon Appétit! When coming for the day, allow enough time to play. Day use hours are generally sunrise to sunset and change with the season. 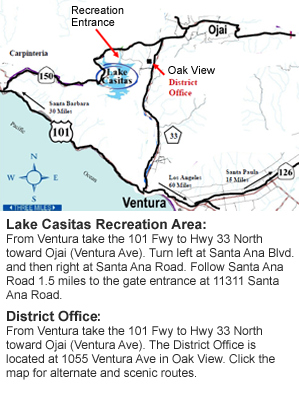 Lake Casitas Recreation Area user fees fund all park operations and maintenance at Lake Casitas Recreation Area. As an Enterprise Fund facility, the Recreation Area is mandated to generate sufficient revenue to cover all operating expenses with no subsidy of taxpayer or water ratepayer dollars.